1. Image size. 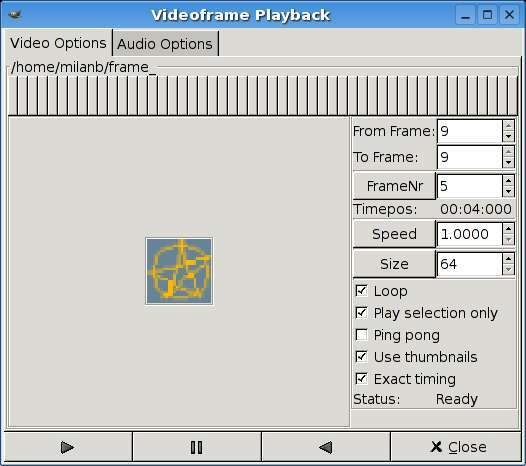 When set to animate, the Videoframe Playback window only allows images to be bigger than 64x64 pixels. Why is this limitation escapes me. My sprites are 25x25 and look very ugly especially since enlargement to 64x64 blurs the pixels. the audioserver executable file ‘wavplay’ was not found. …message, and have to click OK. No I don’t have it installed, I don’t want to install it and I don’t need audio. I just want to animate a bunch of 25x25 sprites for my game. Even better, the Enable checkbox on audio tab isn’t checked. Looks like the authors want us to use the cool audio feature so much, that they made the whole animation thing quite annoying if you decided that you don’t need it. 3. Gimp has some cool animation stuff in Script-fu -> Animators. The only problem is that it creates the animation frames as image layers. Apparently, the only way to make animation from it is to manually copy/paste each of those layers to animation. Not much fun when it has 20+ frames. Anyway, I’m looking for a replacement, if you know any, please let me know.